Aaron Overhead Door is a family owned company providing Los Altos Hills CA garage door repair replacement and installation. We also offer garage door opener repairs and replacements. Our motto is “Where quality comes first!” We offer honest, professional service and we never cut corners. 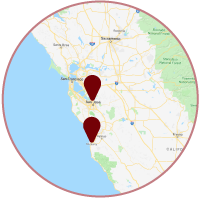 We service all of Los Altos, Ca, including North Los Altos, Central Los Altos, Country Club, Loyola Corners, Old Los Altos, Woodland Acres/ The Highlands, Rancho and South Los Altos . We also service neighboring cities in Silicone Valley. Read our reviews below to find out why your Los Altos Hills CA neighbors call us first, whether they need a stunning new look or a fast garage door repair.